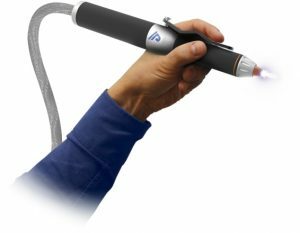 PlasmaBlast™ PB-6000 is the world’s first plasma-based coating removal system that quickly and safely removes hard-to-remove protective coatings and sealants. Using an air plasma beam, the PlasmaBlast precision coating removal system can reliably remove coatings from virtually any substrate material, enabling the inspection of critical welds and joints on a wide range of commercial and government infrastructure equipment. Unlike traditional coating removal methods, PlasmaBlast does not use abrasive media or chemicals, reducing the need for containment and the disposal of waste by-products. The system can significantly reduce the cost of the coating removal process, while increasing the productivity and safety for workers. The PlasmaBlast system uses electricity and a low-pressure compressed air source to produce a special form of atmospheric-pressure air plasma. The plasma beam is scanned across a coated surface to remove the coating layer-by-layer, allowing for full or selective removal, in addition to cleaning and surface preparation. The PlasmaBlast system vaporizes most paint and coatings into harmless gases and leaves behind a small amount of dust that is safely collected with a vacuum. Because the plasma is able to flow around surface features, it is well suited to treat both flat and more complex surfaces. The two main components of a PlasmaBlast coating removal system are the power supply and plasma applicator pen that are connected by an air/power umbilical cable. The power supply provides the electrical power to excite the air into the plasma state and the plasma pen forms and shapes the plasma beam. The prototype system weighs less than 30 pounds, uses compressed air and runs on less than 2.5 kW of power from a standard 240 Volt outlet, making it a truly portable and easily-deployed system. Because the technology does not use abrasive media, water or chemicals to remove coatings, the system can be used in both confined and open spaces, adding to its versatility. The utility requirements are easily met at most commercial/industrial facilities. The system is also easily operated using a field-portable gasoline- or diesel-powered generator and air compressor. APS offers free testing services for your samples. Сopyright © 2019 Atmospheric Plasma Solutions, Inc. All Rights.